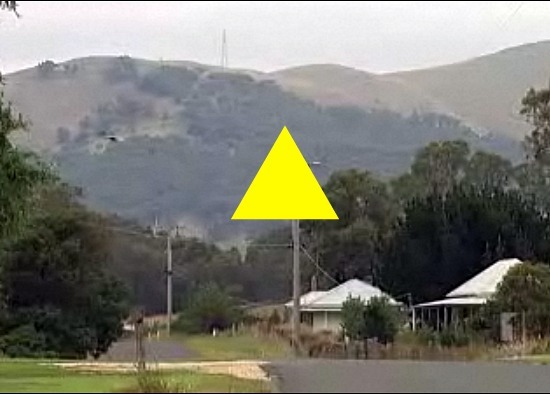 Click on the yellow triangle, below, to watch this ABC News (Australia) video showing live Senate Committee testimony from Australians suffering from Wind Turbine Syndrome. Juxtaposed to this is video of Big Wind developers brazenly telling the same Committee that all such claims are nonsense and, what’s more, that Dr. Sarah Laurie is chiefly responsible for the hysteria seizing rural Australia—a hysteria that threatens to scuttle hundreds of millions of dollars of “clean, green, renewable” wind energy development. We were originally all for this development, the Waubra Wind Generating Facility, and were assured by Acciona Energy that wind turbines were NOT NOISY and were NOT HARMFUL TO OUR HEALTH, as they indeed look harmless enough when you are presented with DOTS ON A MAP! So now I’m driven to desperation and have been planning to climb a HILL, be it a mountain to someone recovering from a recent heart condition, to get some video footage to upload on a YouYube account I created, WAUBRA ILLNESS FACTORY, to let the world know when they too are being SPUN THE GLASS HALF FULL PRESSENTATION by proponents of a WIND ENERGY FACTORY, who have no moral or social conscience, but are in it purely as a capital raising venture disguised as a renewable-energy-must-have-that-is-going-to-save-us-from-global-warming. THIS IS WHAT THOSE DOTS ON A MAP CLOSE TO YOUR HOME WILL IN REALITY BECOME! If all goes to plan, as I have been conditioning myself for some months now, I should be able to upload my video entitled WAUBRA ILLNESS FACTORY by FRIDAY 15 APRIL 2011 AEDT. I’m not crazy, just passionate. Like Dr Sarah Larie. Like her, I have Heavy Shoulders. Believe this! I too have felt the intimidation, the scare tactics of wind developers. They will stop at nothing to achieve their financial goals! Anyone contemplating suicide on account of the turbines—don’t do it! Your life is just as precious! You are needed! Editor’s comment: Well said, Katt! Blessings on you! Unbelievable! I guess money trumps conscience. The community (in the ABC Australia News video) that wants and paid for some turbines will change their tune when they are up and running … unless they have signed a standard gag order. Sheesh! What a global mess of shame and heartbreak! I have been living in Town of Waterloo, South Australia, since 2005. For about the past two months I have been taking blood pressure lowering tablets when, before, my blood pressure was on the low side. To make matters worse, electrical\electronic devices don’t function as well, now, compared with their performance before the wind turbines went on-line. My mobile phone’s reception has been reduced by 30%. At the Roaring 40’s wind developer meeting, we were assured TV and mobile phone and Internet reception would improve. Because the Township of Waterloo and the health problems associated with living near wind turbines have become very public, who would want to purchase my house if I were to sell it? Wind farms have their place, as long as they’re NOT in someone’s front or backyard. We would like to let you know about our urgent concerns for the effect on our health of the Waterloo wind farm. I, Johannes Marciniak, have never slept so badly, since the time the wind farm was built. It has been playing havoc with my blood pressure, diabetes, mood swings, stress, and concentration. I feel irritable most of the time. It also has a weird effect on my two dogs. We know that you, the Senate Committee, know what is causing this problem. This problem also has a massive impact on property value in Waterloo and anywhere near wind farms. We have asked around; people know what’s happening to them. They have health and noise problems, and property re-sale problems. No one wants to live anywhere near wind farms. This wind farm has now destroyed my future! They say you, the Senate Committee, are talking to concerned citizens. We have not seen anyone (from the Committee) in this town yet. What will you, the Senate Committee, do about this problem? Or are you going to let the wind farm kill us by making the health problems many times worse?